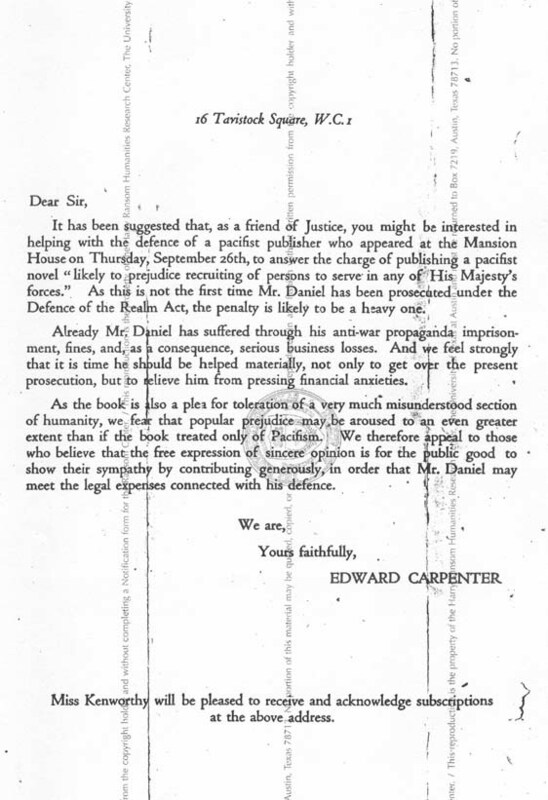 In this letter written in 1918, Carpenter appeals against the banning of the novel Despised and Rejected by A.T. Fitzroy (the pseudonym of Rose Allatini). Ostensibly banned under the Defence of the Realm Act of 1918 because of its subject – a group of conscientious objectors living in London – the novel also included a gay and a lesbian character. As Carpenter notes: ‘the book is also a plea for toleration of a very much misunderstood section of humanity’. Recognising that homosexuality, and not just pacifism, were also at issue here, Carpenter set up a defence fund for the publisher C.W. Daniel. George Ives and Virginia Woolf also lent their support to Allatani.